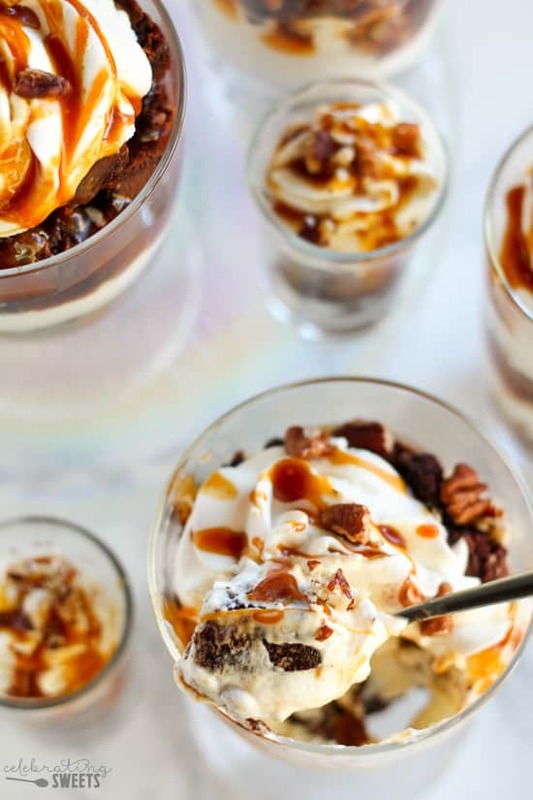 You’ll love these easy trifles made with fudgy brownies, whipped cream, salted caramel sauce, and toasted pecans. 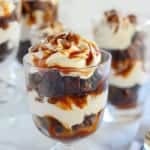 I created this Caramel Pecan Brownie Trifle recipe as part of a shop that has been compensated by Collective Bias, Inc. and its advertiser. All opinions are my own. You know I love a good brownie. I’ve shared over a dozen brownie recipes, and I love them all. So let’s add another to the group! This one is definitely a keeper. 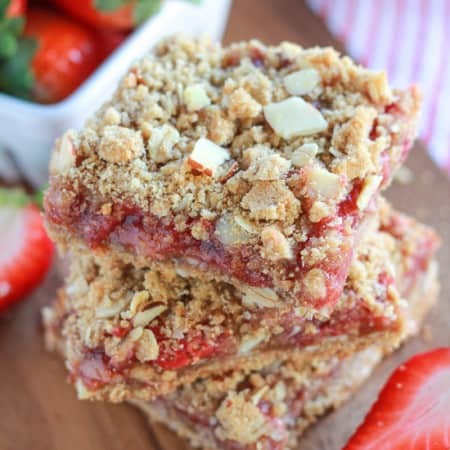 This recipe is super simple (more on that below), elegant, and absolutely delicious! Just look at those caramel-y brownies! I was so excited to hear that Pillsbury came out with a new line of Purely Simple brownie and cake mixes that contain no preservatives, artificial colors or bleached flour. Although I usually make baked goods from scratch, it is great to have the option of taking a shortcut with a boxed mix. These Chocolate Chunk Brownies are super simple to whip up, and they come out fudgy, chewy, and moist. They are great on their own (grab a glass of milk! ), but I took them one step further by using them in my Caramel Pecan Brownie Trifles. 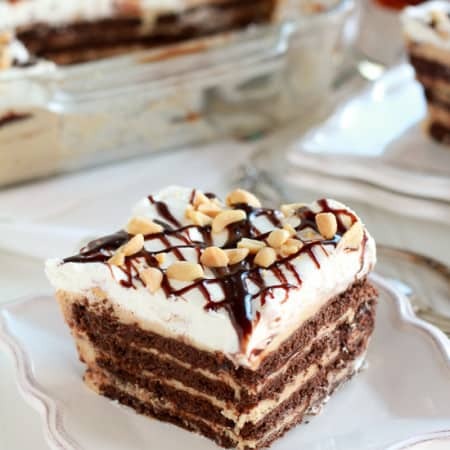 These trifles are the perfect combination of chewy, creamy, crunchy, and gooey – with flavors similar to a chocolate turtle. Trifles are a great dessert for entertaining. I love making individual trifles in small glasses, trifle dishes, or even shot glasses. 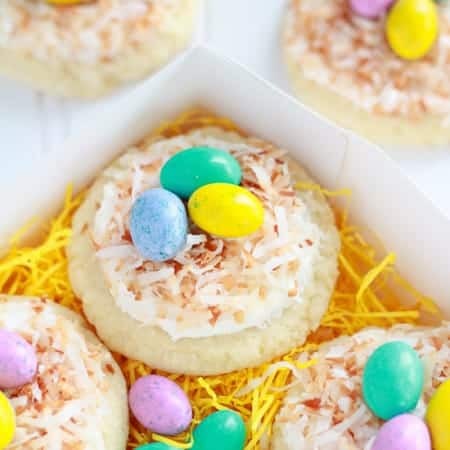 It’s fun to make individual desserts, and your family and friends will love having their own little dessert to enjoy. I served these trifles when I had family over last weekend, and they were a hit. To quote my cousin, “This tastes like heaven in my mouth!” Ha! I hope you feel the same way! I picked up my Pillsbury Purely Simple Mix at Kroger (Fry’s). Let me know what you make with your Purely Simple Mix! Happy baking! 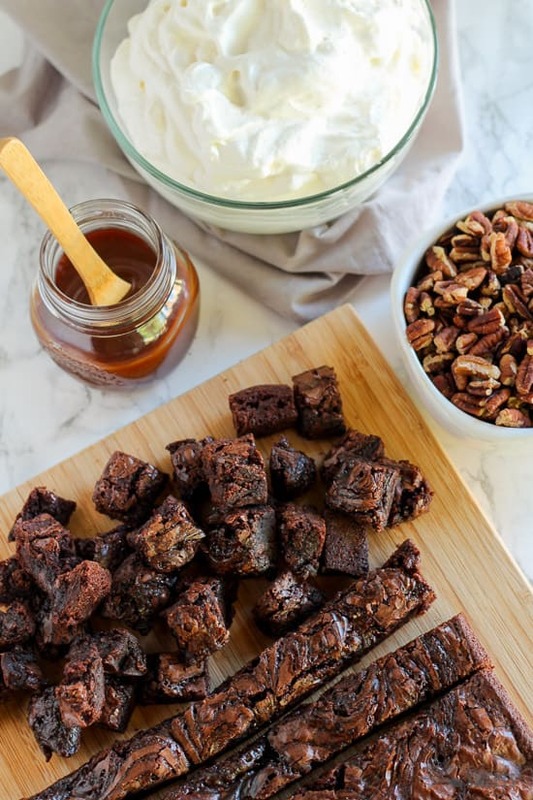 Fudgy brownies layered with whipped cream, salted caramel sauce, and toasted pecans. These trifles are elegant, simple, and delicious! 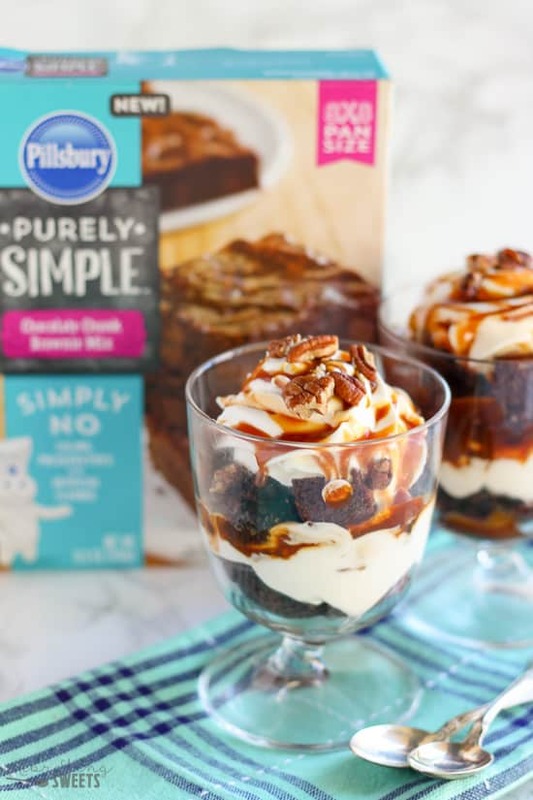 Take a shortcut with Pillsbury Purely Simple Chocolate Chunk Brownie Mix. Preheat oven to 350°F. 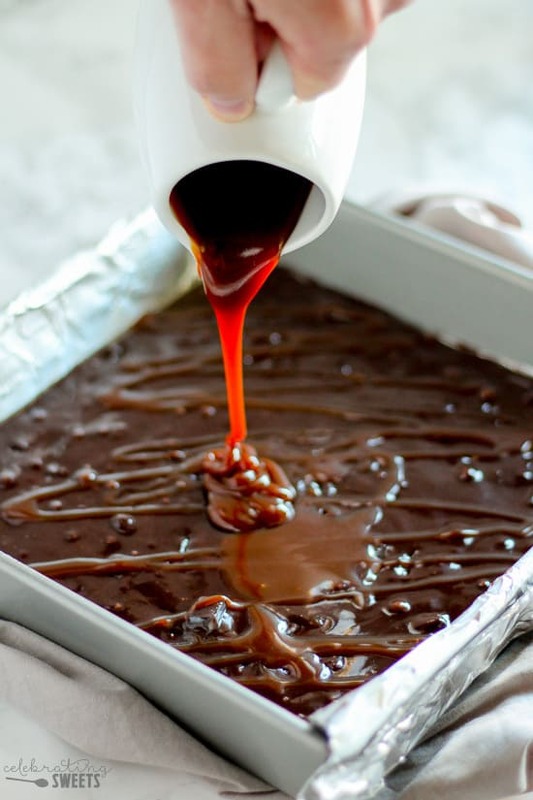 Line an 8x8 or 9x9 square pan with foil, leaving overhang on two sides, and grease the foil and pan (this will allow you to lift the whole tray of brownies out of the pan). Prepare brownie mix according to package directions, then pour batter into prepared pan. Pour 1/3 cup caramel sauce over batter, then use a thin knife to swirl the caramel into the batter. Bake according to package directions. While brownies are baking, toast pecans in a small dry skillet over medium heat, stirring occasionally until fragrant and toasted (watch them closely so they don't burn). Set aside to cool. Using a hand mixer, or stand mixer fitted with the whisk attachment, whip heavy cream, powdered sugar, and vanilla until soft peaks form. Once brownies have cooled, use the foil to lift the brownies out of the pan. Cut the brownies into bite sized pieces. 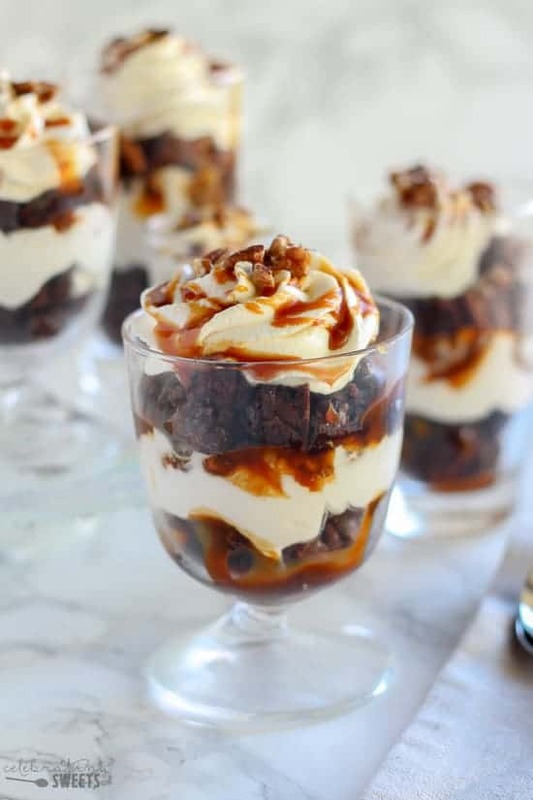 Layer brownies, whipped cream, caramel sauce, and pecans into glasses. You can layer these trifles into individual trifle dishes, small glasses, or even shot glasses. If you'd prefer to make one large trifle, I would suggest doubling the recipe. Can they be made ahead of time and put in the fridge? We are going to a dinner party and I am bringing a dessert! They look amazing! Yes, definitely! They should keep for several hours. They’ll be best if they’re eaten the day they’re made. Enjoy!